With funding from the United States National Science Foundation, 30 historical short stories designed to teach science content and draw students’ attention to the nature of science (NOS) have been created for post-secondary introductory astronomy, biology, chemistry, geology, and physics courses. The project rationale, story development and structure, and freely available stories at the project website are presented. Partial support for this work was provided by the National Science Foundation’s Course Curriculum, and Laboratory Improvement (CCLI) program under Award No. 0618446. Any opinions, findings, and conclusions or recommendations expressed in this material are those of the authors and do not necessarily reflect the views of the National Science Foundation. Eccles, J. (2005). Why women shy away from careers in science and math. U of M News Service, available at http://www.umich.edu/news/index.html?Releases/2005/Apr05/r041405, retrieved 21 June 2009. Jahn, M. (2005). Narratology: A guide to the theory of narrative, University of Cologne, Cologne, available at http://www.uni-koeln.de/~ame02/pppn.htm#N1, retrieved 1 Oct 2009. James, W. (1907). ‘The social value of the college-bred’, Address delivered at a meeting of the Association of American Alumnae at Radcliff College, 7 Nov, available at http://www.des.emory.edu/mfp/jaCollegeBred.html, retrieved 21 June 2009. Lederman, N. G. (1998). ‘The state of science education: subject matter without context. Electronic Journal of Science Education, 3(2), available at http://www.unr.edu/homepage/jcannon/ejse/lederman.html, retrieved 21 June 2009. National Science Teachers Association. (2000). NSTA position statement—Nature of science. Washington, DC: NSTA, available at http://www.nsta.org/about/positions/natureofscience.aspx, retrieved 27 July 2010. Rudolph, J. L. (2007). An inconvenient truth about science education. Teachers College Record, http://www.tcrecord.org, ID Number: 13216, Date Accessed: 9/26/2007. 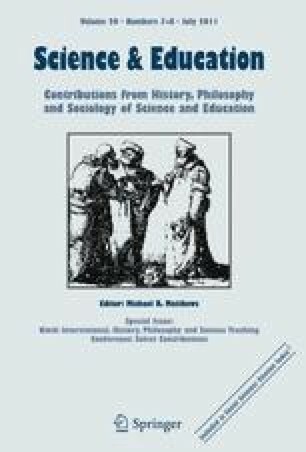 Williams, B., Clough, M. P., Stanley, M., & Colbert, J. T. (2010). Creativity and discovery: The work of Gregor Mendel. Available at http://www.storybehindthescience.org/biology.html, retrieved 29 July 2010.